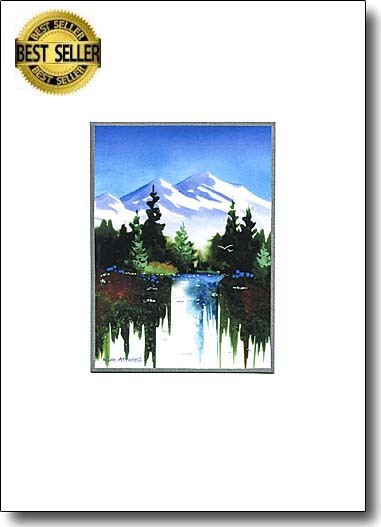 Paintings of mountain scenes have a universal appeal. 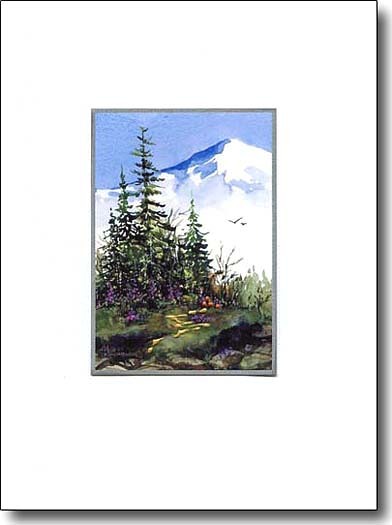 Mountain cards are perfect for a man's birthday, Father's Day and are an all occasion card with an inspiring image. Wouldn't you like to escape to this simple place? 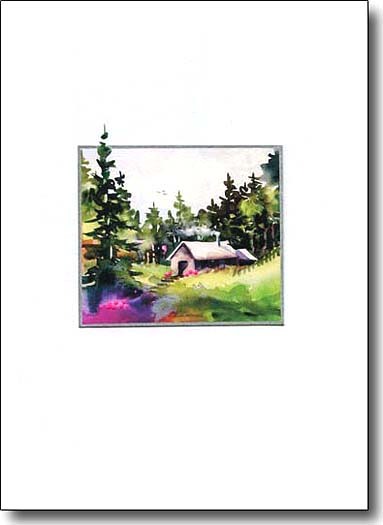 Why not frame it for yourself so you can remember this cozy cabin. This is a dramatic favorite of mine. Each embellishment brings me pleasure. 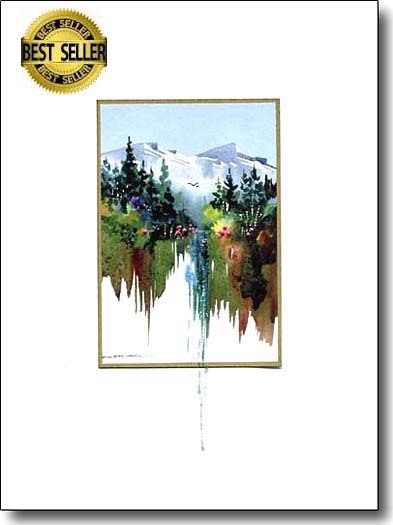 Letting the water fall out of the image is a very eye catching detail. Sharing an exhilarating climb together. 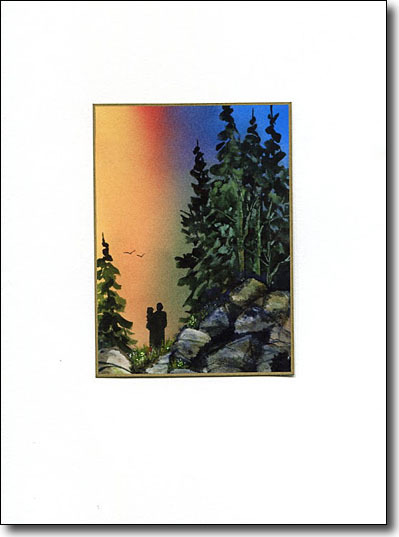 This card is perfect for anniversaries and other celebrations of love. Sun kissed warm fields show you that Autumn is in full color. The foreground reeds are touched with gold. Send this as a celebration of the season. I painted this colorful image to put this couple in and was surprised when a customer said she saw herself holding her grand baby in it. See it? what fun! 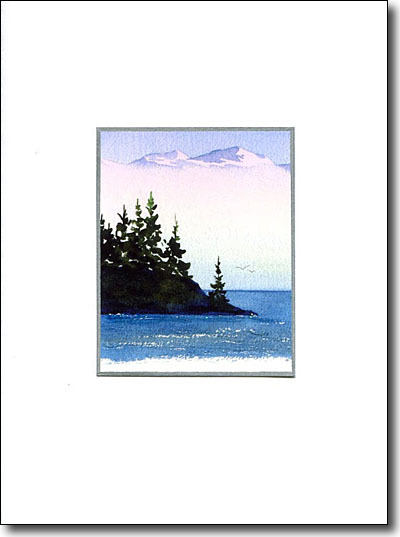 Dramatic and colorful, this best seller among the mountain cards draws you over the lake to the blue flowers at the base of the evergreens. 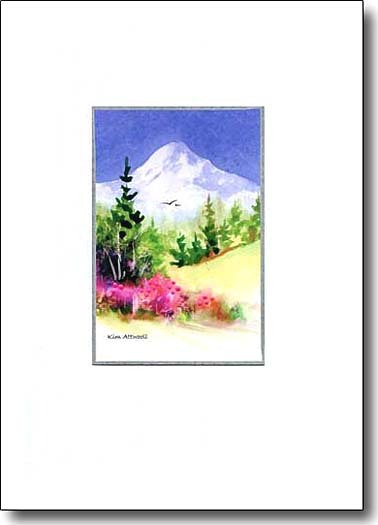 It's a celebration of the beauty of nature and makes a great all occasion greeting card. This painting holds a surprise. There's a deer peeking out at you. I embellish a gold path to help you find her. Folks in northern Oregon/ southern Washington have this picturesque mountain gracing their vista. How lucky they are. 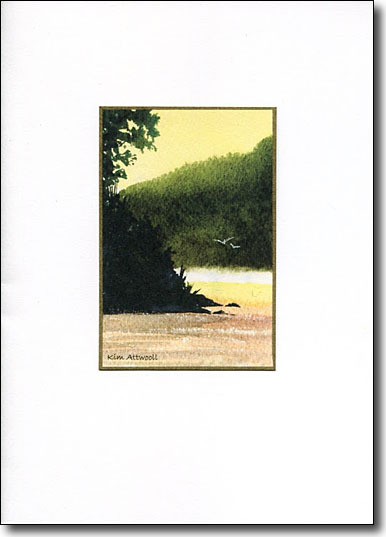 Why not frame it in a standard 5x7 frame to enjoy it where ever you are. Standing on the southern shore of Vancouver Island looking across the strait to the US, I was fortunate to catch this atmospheric sea fog. 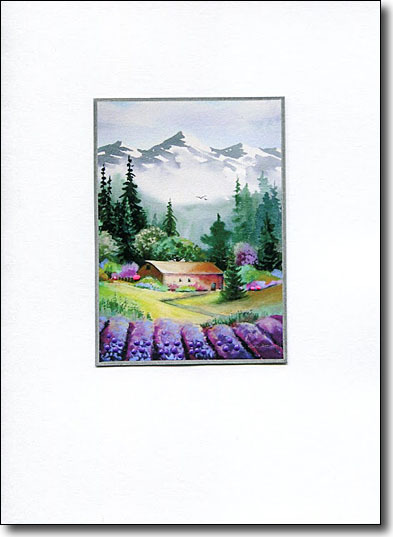 My painting shows the top of the Olympic mountains in Washington. 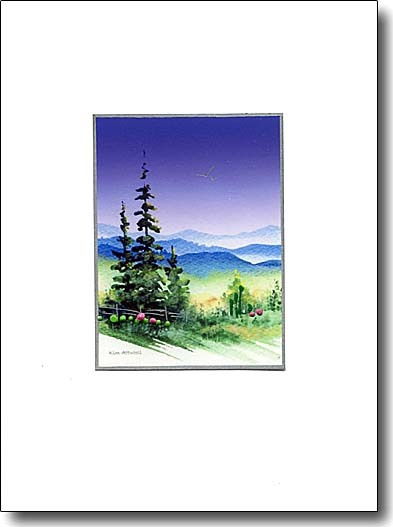 This watercolor captures the rolling beauty of this very old mountain range. I enhance each one with a silver fence and flowers. It could be framed as a unique gift. 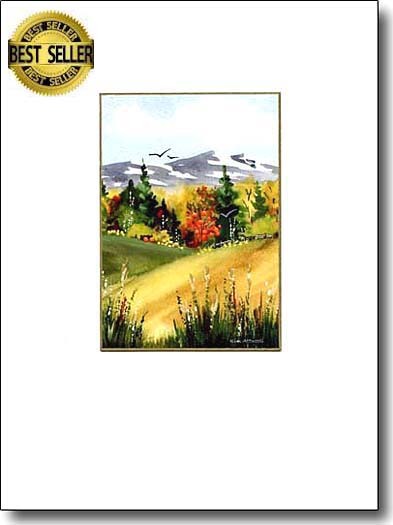 This best seller captures the beauty of the Blue Ridge Mountains. 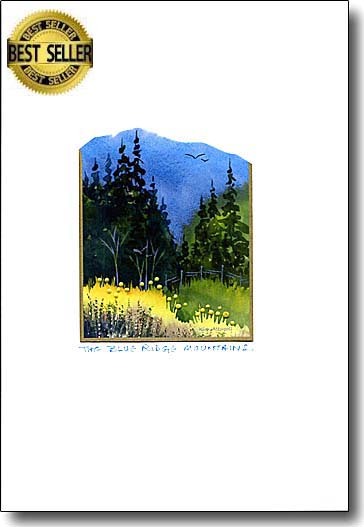 The yellow flowers pop with brightness and every card is cut along the ridge of the mountains by me to add a unique touch. Warm colors imbue this atmospheric painting. The water glistens with my embellishment. 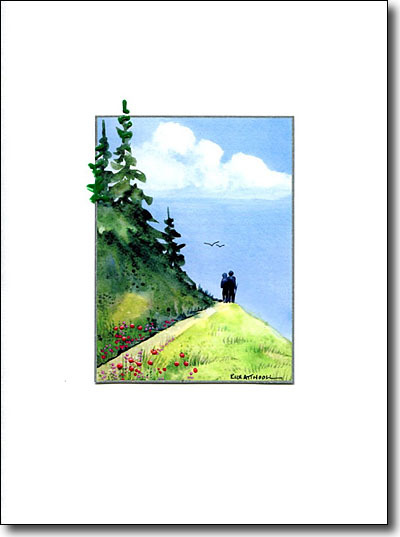 It could be a touching sympathy card. A funny story was the genesis of this image. When I asked why it was called happy valley, I was told that in the 1800's it was populated by bachelors only.